Rich, meaty cut for fabulous casseroles. Braise low and slow for intensely rich flavour and an unmistakable, falling-apart texture. 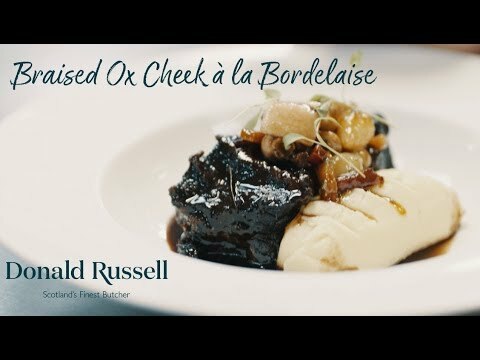 Watch Rikki Preston, Head Chef at 'The Honours', create his stunning Braised Ox Cheek à la Bordelaise. Once you’ve done that, why not try the recipe for yourself. Pre-heat the oven to 140 C-160°C/Fan 120-140°C/Gas 1-3. Do not burn the meat as it makes it taste bitter. Then take out the meat and sear the vegetables until nicely caramelised. After searing the vegetables, place the meat back in the pan. Add wine, stock or a mixture, and herbs such as bay leaf, peppercorns or cloves. Cooking times vary depending on the cut and your oven. As a rule of thumb, you should check casseroles after 1 hour and at regular intervals thereafter.